When Does Renaming a Building Make Sense? At Yale, the decision to rename a college named after an outspoken defender of slavery was not taken lightly. The first time I go inside Calhoun College, I am not thinking about the name. It is the second week of my freshman year, and my roommate and I are still giddy with excitement about being at Yale. We are nearing the end of a two-week challenge we set for ourselves: to get to know the campus by having a meal in each of the 12 residential-college dining halls. Calhoun’s has a cozy common room in front, two grand fireplaces bookending the bustling hall, and soft natural light streaming in through decorated stained glass. So far, Calhoun seems like it will be in the running for one of our favorite dining halls. Then I look up at the window. The image that greets me is one that will go on to make headlines nearly two years later when a black dining-hall employee named Corey Menafee takes a broom to the window and shatters it into 27 pieces. When asked why he did it, Menafee will say to the New Haven Independent, “It’s 2016. I shouldn’t have to come to work and see things like that.” But it is 2014, during my second week at Yale, and the window is still intact. I am transfixed by what I see: two black figures, an enslaved man and woman—the only black woman I have seen depicted in art at Yale so far—with baskets on their heads, picking cotton. Other details of the room start to come into focus: the portrait of John C. Calhoun hanging over one mantel, the minstrel show–like image of a man in blackface eating a watermelon, the panels dedicated to South Carolina plantation scenery. I feel like crying or running away—doing anything besides eating lunch and chatting with my new roommate. I struggle through the meal and quietly promise myself to avoid Calhoun College as best I can for the next four years. I did not end up keeping my promise. My sophomore year, Calhoun wove in and out of conversations with friends, in class, and even with people back home following the announcement by Yale’s president that the university would consider renaming Calhoun, in the aftermath of the massacre at Emanuel A.M.E. Church. I grew up in Charleston and attended elementary school directly across the street from Mother Emanuel, on Calhoun Street. It was coming of age in a historic city that taught me the importance of remembering the past. It was standing on Calhoun’s namesake street after the shooting, crying with family and strangers, that convinced me that what and whom we choose to memorialize from the past also serve as powerful symbols of the present. After a year of community conversations and demonstrations, in May of 2016 Yale decided not to change the name of Calhoun. In the spring and summer after that announcement, columns chastised, letters pleaded, and the window in the dining hall depicting the two slaves was shattered. 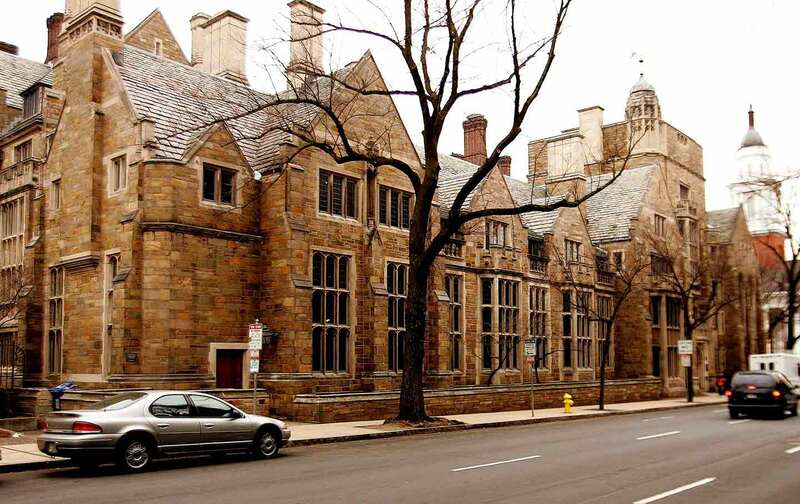 The decision turned out not to be final: In August, the Yale community received an e-mail from President Salovey saying that a committee would be convened to create standards for renaming buildings, standards that would be applied to a revisited case for renaming Calhoun College. There was one spot on the committee for an undergraduate. I applied, and just before my junior year began, my non-engagement pact with Calhoun definitively ended. Over the course of four months, I spoke in person with 188 undergraduates about Calhoun and the question of renaming more generally. These conversations were supplemented by reports, articles, personal writings, e-mails, and meeting transcripts that drew from hundreds more student voices that had spoken out about Calhoun the previous year. Beyond community engagement, the committee read through thousands of pages on the history and theory of public memory and renaming. Why do all of this? Why not just scrap Calhoun or preserve Calhoun and then move on? While there were days I asked myself these questions, I was reminded time and time again throughout the committee’s process that the situation Yale had found itself in was about more than Calhoun, more than even the scores of namesakes honored around campus. Our community was engaged in an important struggle over how symbolism and history assert themselves in our lives, and how they impact diverse communities differently. On these issues, my peers spoke with incredible passion, insight, and a profound love for the Yale community that turned even the sharpest criticisms of the university into salves for its deepest wounds. Many undergraduates appealed to what they saw as Yale’s highest values—community, learning, and diversity of experience and thought among them—just as they expressed a pervasive sentiment that Yale as an institution did not always live up to those values. One student, a black student, said that racist and otherwise hurtful symbols he confronted on campus did not surprise him at an old university so entwined with our nation’s murky history: “I expected things like this,” he told me with a shrug. At one listening session, a student offered a different perspective. She cited Yale’s “obsession with its own history” as a crucial impediment to the school’s progression into the future. Her comment resonated with others in the room who took a moment to look around the imitation-Gothic stonework, the leaded windows, the dark fireplaces that had spent most of their lives sealed in—all built in the 1930s. Students were invested in history, of course, and felt strongly that Yale was obligated to teach and preserve the past in all its glory and shame, but most believed that Yale could carry out its responsibility to history without compromising its commitment to its present-day student body. Every single listening session, meeting, and individual conversation about renaming and symbolism eventually circled around to the importance of community. Yale students love the residential colleges, the places where we study, live, eat, make friends, play Frisbee, meet our professors, and feel at home. Many students stressed the importance, or even sacredness, of the colleges in particular as spaces where they and all their peers should feel welcomed. Your home is not the place to engage in a battle with history, many argued, it is the place to rest after fighting that battle in the classroom and the rest of the world. In particular, students of color and those with other marginalized identities spoke to the power symbols and memorials have to announce priorities and demarcate the boundaries of inclusive and exclusive spaces. Many shared stories that mirrored my experience freshman year—loss of appetite or loss of a sense of belonging at Yale after seeing the windows in Calhoun or similar iconography, learning that the namesake of a building or room would not have wanted them in it, or else confronting the serious lack of representation of their identity on campus. Many emphasized that symbolism has as much to do with absences as it does presence. People described the struggle to exist in a space that had historically excluded us, as well as the desire to see evidence of our existence—in the names etched on buildings, in the portraits hanging proudly on walls. For decades now, students of color, women, low-income students, those with disabilities, and so many others have fought to make a home at Yale, and many felt it was time to feel the fruits of that labor, both through the recognition and reconsideration of the painful symbols that picked at the scabs of painful histories and through increased diversity in symbols that could mirror the community’s range of members. Had it been possible, I might have spent an eternity talking with my peers about building names, just to take in the passion and thoughtfulness that make up the spirit of Yale. The committee had to start making decisions, however, and by late November, we had a draft of principles. The final report was over 20 pages—the most condensed a fair account of the complexity and range of considerations surrounding renaming could be. In the report, we played a balancing game that involved assuaging fears of both the most conservative and liberal, young and old members of the community, while offering principles that were fair to both the historic legacy of Yale and the Yale of today and the future. We began with an assumption against renaming, one that honored the university’s commitment to history and continuity, and transitioned into the special circumstances that would warrant removing a name. Like the undergraduates who had called for change at Yale, the committee report appealed to the institution’s values: “Is a principal legacy of the namesake fundamentally at odds with the mission of the University?” If the answer was yes, three further principles offered circumstances under which a name change on the basis of values would be especially appropriate: if the namesake’s actions and ideas were a subject of debate even in their own lifetime, if the university knowingly acted against its own mission in choosing a certain namesake, and if the building was central to community life and unity. It was not the committee’s job to decide whether to rename Calhoun, and the principles themselves avoided specific reference to him. Still, in the days following the report’s release, there seemed to be no doubt in anyone’s mind that under those principles, John C. Calhoun was unfit to be the namesake of a residential college at Yale. Our community had already undergone a year of highly publicized tumult. After the report release, the campus settled into relative peace and quiet while we all awaited the final word on Calhoun. Just last week, the news came, and the college on the corner of Elm and College Streets will now be called Grace Murray Hopper. The decision on campus was met with a full day of celebration and relief. Universities everywhere, cities, states, and the country as a whole continue to struggle to preserve history without perpetuating inequality and prejudice. Though none of these challenges will be met easily, I believe firmly that possibilities exist, and we must pursue them with the confidence that we can build communities that welcome all people of all backgrounds home. To find these solutions, we must engage in thoughtful dialogue and compromise, but we cannot settle for others’ exclusion, or our own. I, for one, will no longer be promising myself to avoid eating in the college formerly known as Calhoun. Dasia MooreDasia Moore is a junior at Yale College currently studying abroad at the University of Amsterdam.